Kai Ryssdal 85C goes to work in the middle of the night. Its 3:21 a.m. and most of downtown Los Angeles is sleeping, but Ryssdal, looking crisp and caffeinated in a polo shirt and khakis, already has been at work for more than two hours. And he has seven to go. So Im on the air in half an hour, and I have absolutely no idea what Im going to say, he says, cheerfully, navigating the brightly lit but empty offices of the radio company Marketplace Productions. Ryssdal is the early-morning anchor for Marketplace Morning Report, a business and financial news show carried by some 320 public radio stations nationwide (including the Atlanta affiliate, WABE) and heard by more than 4.5 million people each week. When he takes the microphone at 3:50 a.m., thousands of working listeners on the East Coast, where its a more civilized seven in the morning, will be tuned in while they shave, put on mascara, or drive to work. Ryssdals off-kilter workday, it soon becomes clear, is carved not into hours, but minutes; even seconds count. His show, which he will deliver once every hour between 2:50 a.m. and 8:50 a.m. this morning, must last precisely seven minutes and fifty seconds. Ryssdal puts together his own script for the most part by scrolling rapidly through a hodgepodge of sources for the days notable business stories: the Associated Press and Reuters wire services, major newspapers, favorite websites, and scripts left for him by the Marketplace night editor. The assistant producer at the cubicle across the way, B.B. Rivero, lets Ryssdal know what segments are filed and ready to go from various news correspondentsand of course, how long they are, down to the second. With just Rivero for company, Ryssdals pre-dawn work routine is deceptively quiet. Besides the clicking of the computer keyboards, the only sound is his voice as he talks through the script on his screen, making sure the show is the correct length and testing how it sounds. Then, without warning, hes out of his chair. Rivero jumps up, too. Showtime! Ryssdal says, and they head for the studio at a smart clip, plucking the script from the printer on the way. Sitting on a stool in the studio booth, Ryssdal is clearly at ease behind the microphone, and its easy to see why the program gets dozens of letters from listeners each week (paticularly from women, according to colleagues). He injects his delivery with just enough of his own style to give it flavor without being distracting. The lead news item this September morning is the Kodak companys plan to downsize its traditional film products and go digital. What do you do when your signature product is losing some of its luster? Ryssdal starts off smoothly. If youre Kodak, you change your focus a bit. This sort of mild-mannered humor is a Ryssdal trademark. 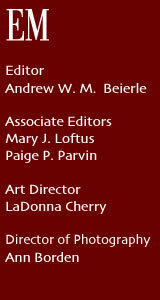 Marketplace is known for looking at business and economics sideways, giving the news a fresh slant. Other stories of the day include a dip in demand for durable goods like cars, an increase in the gap between rich and poor (the widest its been since 1979), an update on the pay scandal at the New York Stock Exchange, and Starbucks plan to open up shop in cafe-laden France. The shows tone is light without being fluffy, carried along by longer features such as a two-and-a-half minute report from London correspondent Stephen Beard about a surge in the production of English wines, thanks to a bumper crop of grapes, while more refined French winemaking suffers from the summer drought; and the Chinese governments intention to improve the countrys international image by cultivating more and better public relations experts. In the adjoining sound booth, the technician starts the Jocelyn Ford story with the push of a button on the vast, mysteriously blinking control panel and voila: Ryssdal has forty-nine seconds to breathe. Ryssdals 3:50 a.m. broadcast is only the second of what turns out to be an unusually long day. Tess Vigeland, the other Marketplace Morning Report host who goes on the air at 6:50 a.m., is out with a back injury, so Ryssdal must carry the show solo through the final broadcast at 8:50 a.m. In between live broadcasts, he tapes two interviews for future shows: one with ESPN.com senior editor Michael Knisley about a major NFL lawsuit and one for another public radio show in which Ryssdal himself is the expert on the Kodak story. 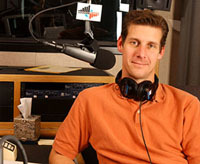 Despite the fact that he has to perform seven on-air broadcasts in a row, which offer more or less the same major stories, Ryssdal freshens each successive show by changing the wording, the order, and the minor news items. Its a sign of Ryssdals dedication, Rivero points out, that he spices up each segment just in case there are repeat listeners, even though their research shows most people dont tune in to NPR for two hours straight in the morning. A key aspect of Ryssdals job is to translate the news from business jargon into language the listening public can understand. When he arrived at Marketplace, he says, the learning curve was steep and the intellectual bar was high. With only a small staff working twenty-two hours out of twenty-four, Marketplace is less a source for breaking or straight-up news than for smart commentary. Ryssdals favorite business stories are those with an interesting twist or a hint of fun, such as a recent piece on the economics of exotic dancing. Ryssdal likes to joke that he went to Emory back when he could get in. Ryssdal says he chose Emory because it was time to make a change from Westchester County, New York, where he had lived with his parents and little brother since he was eight. Before that, his family lived in Denmark and England where his father worked for an airline. Instead, he majored in a natural interest, history. 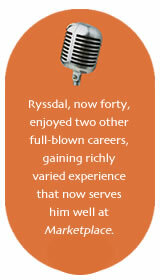 Ryssdal also got some theatre experience while at Emory, which may have prepared him somewhat for radio work. Still, he didnt anticipate his most recent career twist. True, before getting into radio, Ryssdal, now forty, enjoyed two other full-blown careers, gaining richly varied experience that now serves him well at Marketplace. Three weeks after he graduated from Emory, he threw everything he owned into the back of his car and drove down to Pensacola for naval officer training. He spent eight years in the Navy, first flying planes from the aircraft carrier U.S.S. Theodore Roosevelt and then as a briefing officer for the Pentagon Joint Chiefs of Staff. Ryssdal also earned a masters degree in national security studies from Georgetown University. At that point, I had done everything I wanted to do in the Navy, he says. I had gone to sea, learned how to fly, and worked at the Pentagon. So at twenty-nine, he took the foreign service exam and went to work for the U.S. State Department for four years. It was in the foreign service orientation that Ryssdal met his wife, Stephanie Fossan, just before taking an assignment in Ottawa, Canada. For their next assignment, the two offered to go anywhere they were needed as long as they could be together. So they spent six months learning Chinese for positions in Beijing. They had been in China for eighteen months when they learned that Stephanie had been accepted to the MBA program at Stanford University. We quit our jobs, got married, she started school, and I moped around for awhile, trying to figure out what to do with the rest of my life, Ryssdal remembers. In the fall of 1997, Ryssdal was shelving books at a Borders bookstore in Palo Alto when he stumbled across a book on internships in radio journalism. 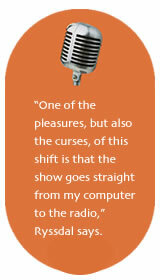 A self-professed news junkie, he had always been interested in radio and the spoken word. So he put on his State Department suit and tie (thats before I learned no one ever wears a tie in radio, he says) and applied at KQED-FM in San Francisco. They offered him a beginning-level internship position two days a weekquite an about-face from flying Navy planes and working at the Pentagon. But the move turned out to be a good one. At KQED, Ryssdal learned the radio business from the ground up: How to work the equipment, tape record a show, hold a microphone, conduct an interview, and put together a story. He caught on fast and soon became a morning news producer, then a part-time reporter with a monthly contract, and eventually a regular substitute anchor. It took me close to a year to get on the air, he says. Ryssdal remembers that the first time he was called upon to host the KQED afternoon show, he dropped his entire script as soon as he went on the air and it cascaded to the floor in a disordered jumble. He did manage to collect it, trying to contain the rustling sounds, while drawing on memory to start the show. It got easier. When Marketplace called, Ryssdal was working as a reporter and substitute host for KQEDs California Morning Report, a news program that ran on public radio stations around the state. He covered business and the economy, state politics, criminal justice, capital punishment, and agriculture, winning awards from the Radio and Television News Directors Association and the Public Radio News Directors Association. So he flew to L.A. and interviewed in May 2001, returned to San Francisco, had a baby, and got an offer from the program, which is produced by Minnesota Public Radio. The family moved to L.A. in July. And Ryssdal hasnt had any real sleep since. He gets to work at one a.m. and, after his final broadcast somewhere near dawn, goes for a long run in the downtown L.A. area before the morning editorial meeting. He leaves the office at ten, sleeps from 11 to 2:30, then picks up his two young sons, Tait and Adin (he and his wife are expecting a third boy in March) from school and spends the afternoon and evening with his family. He grabs another quick nap from 10 p.m. until midnight, and then its back to the studio. But the grueling shift pays off for Ryssdal when there are magic moments such as a recent interview with Michael Lewis, author of the hit financial book Moneyball.